I have long hairs and sometimes I get the urge to get them cut and get some style done but then I remember my mum's non approval of the same and I don't do it and then after two days I thank myself for remembering her words at the right time and not getting my hair shorter at whim because I love my tresses. But with time, change of places, water, weather, pollution and stress the hair strength has reduced leading to hair fall and I get really worried, the volume has gone. In today's world when food (which give nutrition) is adulterated, there is so much stress about every damn thing and so much pollution, it is difficult to maintain hair and keep them healthy as well. Recently I had been To Ladakh (about which you can read here) and it is a region of contrast. Although I enjoyed the cold breeze, dust, snow fall, rain, humidity and every other thing about my trip, what I did not love was the state of my hair post my return. They had become dry and brittle. On my return one good thing happened as well. I was awaited by cute surprise gift by Himalaya on my desk. The gift contained #4FabulousHair collection viz. Anti-Hair Fall hair oil, shampoo, conditioner and the cream. It was time to start using and getting my tresses back on track. It is been more than 20 days that I using this range and I must say that it has started doing its job. Although the difference ain't much, hair fall is still there but has reduced a bit considering the weather change as well but hair definitely feel voluminous and soft. I usually wash my hair once to twice a week depending upon the season and since it's monsoon, it has mostly been once a week. My regime with this range is here for you. Please go through the steps herein below to save you hair before they become rare. The Himalaya Anti-Hair fall Hair Oil which is enriched with the goodness of Bhringaraja and Amalaki strengthens the root shafts and prevent hair fall. --> Part your hair and apply the oil on scalp. Massage the scalp gently in a circular motion using your fingertips so that the oil is absorbed into the scalp. Soak a towel in hot water and wrap your hair with for 30 min before washing. The Himalaya Anti-Hair fall Shampoo includes an ayurvedic composition of Bhringaraja and Butea Frondosa that helps reduce hair fall due to breakage and conditions and improves hair texture. --> Gently massage Himalaya's Anti-hair fall shampoo into wet hair and scalp. Leave for two to three minutes, and rinse thoroughly. Repeat if necessary. As claimed by Himalaya, the product is effective for all hair types and is safe to use on artificially colored or permed hair. The Himalaya Anti-Hair fall Conditioner is formulated with Butea Frondosa, Bhringaraja and Chickpea that nourishes hair and helps prevent excess hair fall, leaving hair soft, silky and smooth. --> After shampooing, gently apply Himalaya's Anti-Hair fall Conditioner along the length of hair from base to tip. Leave for two minutes and rinse thoroughly after. As claimed by Himalaya, the product is effective for all hair types and is safe to use on artificially colored or permed hair. The herb based Himalaya Anti-Hair fall Cream is a daily-use formula including Bhringaraja and Amalaki for reducing hair fall and strengthening hair follicles. --> After conditioning, take a small amount of Himalaya's Anti-Hair Fall cream and gently run it through hair strands, while it's damp. Use it regularly after conditioning to maintain healthy hair. As claimed by Himalaya, the product is effective for all hair types and is safe to use on artificially colored or permed hair. 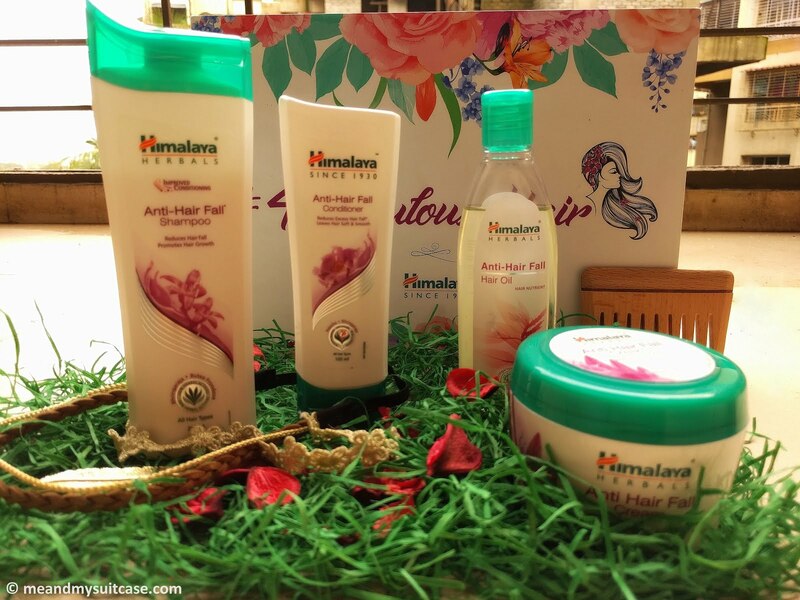 I am sure to get rid of your hair problems you won't shy away from trying this Himalaya range. Here's wishing you fabulous Hair.